It'd be completely pointless and lazy for me to talk about Mattel's failings at the moment, not to mention ridiculously easy, so let's talk about some of the things they have done right. Against their usual bad decision of flooding the market with similar (or the same) products and then complaining about products not selling, Mattel withdrew their popular, decent Movie Masters line to become more of a collector-oritented series available only online and for a higher price. When sales flourished, the wise decision was made to put them back into the mainstream market at the original price, and now they're (seemingly) selling very well, despite the fact that the characters are from a movie nearly two years old. (One of the best movies of the decade, and ever, to be sure, but still.) And thus today's excellent figure for review isn't a chore to acquire, available at your local Toys Я Us, amongst others. 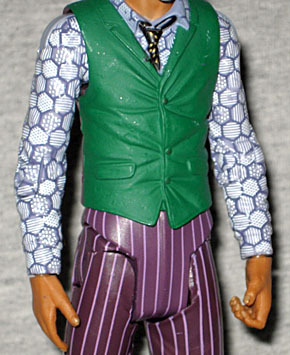 Although Mattel's previous Movie Masters Joker figure was not bad, this new "Jail Cell" Joker brings it to a whole new level. 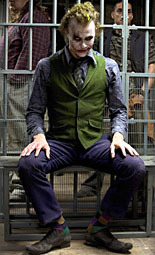 Based on the scene from the film where the Joker is captured by Batman and the Gotham law enforcement, he looks smashing here in pin-striped purple trousers and a green and purple waistcoat over a patterned long-sleeve shirt. The patterns across the clothes (including a gold-spotted tie) are flawless; there've been some complaints about the back of the waistcoat being a different colour from the front, and although I cannot confirm whether that is authentic to the movie it doesn't bother me. The bigger improvement, however, is the excellent facial sculpt, which perfectly captures our late Heath courtesy of much improved paint aps. Whereas the original's face had little shading or detail on the eyes, cheeks or mouth, this one has great paint aps which bring out the scars on the cheeks as well as the permanently grinning mouth and the look of evil glee in the eyes. The edge of the face is skintone where the Joker's own facepaint runs out, which is nicely authentic; less impressive is the simply detailed hair, which is effective despite its simplicity. Like the other Movie Masters figures, the Joker is heavily articulated, with balljoints at the arms and neck, the special DCUC joints at the legs, then joints at the wrists, elbows, knees, thighs and feet. Both durable and poseable, this is exactly what you want, although due to the upper legs being slightly too big he can't get into the same sitting pose as seen in the scene. A shame, but not a complete write-off by any standard. Don't try to move his legs too far up to the front, though, or they'll cause the plastic of his crotch to warp noticably. And would it have killed them to include biceps joints? Less impressive is the lack of accessories, including only a silly multicoloured rocket launcher (with a rocket with a face on it). Seriously, Mattel? I kind of liked the other Movie Masters figures including a prop replica, which is completely absent here, and this rocket launcher seems designed more for young children than real collectors. I think I would have liked it more if it had an action feature and fired, for dog's sake. The tiny knife included in the original was better than this. 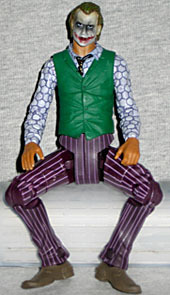 Regardless, "Jail Cell" Joker is an excellent figure, and the kind we should praise Mattel for making. It's nice to see them make a positive decision for once, and having the excellent Movie Masters figures on store shelves instead of available exclusively online is a promising one. Let's see more of putting their fine toys into the hands of the collectors, not the scalpers.